Window to the Womb, private baby scan specialists, have released their exclusive free pregnancy app on Android. It’s already available to expectant parents on IOS devices such as iPhones, but in celebration of the Android release, Window to the Womb are offering the app to all expectant parents who wish to create a remarkable video of their growing bump. Originally inspired by Mcfly’s Tom Fletcher and his wife Giovanna’s famous YouTube bump video: Bumpies allows users to snap, save and share photos of their bump from 5 to 40 weeks gestation. Once you have 5 or more ‘Bumpies’, the app will stitch all these images together to make a clever time-lapse video; meaning you’re able to enjoy the magic of your 9-month pregnancy in just 90 seconds. Users can then share their bump images and videos INSTANTLY with family and friends. It’s the perfect way to track their bumps’ progress and best of all – it’s 100% free, with no ads or in-app purchases. 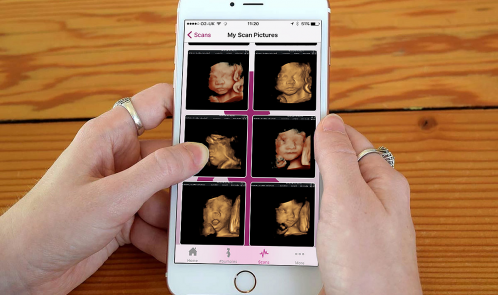 Additionally, the app allows users to keep a ‘scan image diary’, in which they can access their scan images from Window to the Womb, who offer pregnancy scans from 6 to 40 weeks. After visiting one of their clinics for a private baby scan (package dependent), customers are offered a unique code, which allows them to view all their 2D, 3D and 4D scan memories – then share them with loved ones across social media platforms. It’s a valuable keepsake for the family and a handy tool for storing baby scan memories on-the-go…perfect for a visit to the Grandparents. The app was first created in 2015 and has greatly evolved since its’ original release – with nearly 50,000 current users nationwide, nearly 500,000 scan images shared, as well as being ranked #159 in the Health and Fitness category on the Apple App Store. It’s simple and easy to use: users download the app, set up a login with a due date, email address and password. Users are asked to #Bumpies on their scan images and videos too – so Mums, Dads and families can share the joy.